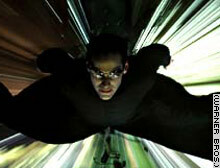 Keanu Reeves in "The Matrix Reloaded." (Court TV) -- "The Matrix Reloaded," a futuristic action�movie�about a band of hackers rebelling against their mechanized overlords, has already taken over the nation's movie screens.� Now it's threatening to take over courtrooms, as well. But while moviegoers have been entranced by the Keanu Reeves vehicle,�coughing up�more than $90 million in�the sequel's�opening weekend alone, it remains to be seen whether jurors will buy the "Matrix"-based insanity defenses that have cropped up lately. Just last week,�Hamilton, Ohio, resident Tonda Lynn Ansley�was�found not guilty by reason of insanity�after claiming she thought her�landlord was�part of a conspiracy to brainwash and kill her.�Ansley shot the woman several times in the head in July 2002. "They commit a lot of crimes in 'The Matrix,'" Ansley allegedly told police.� "That's where you go to sleep at night and they drug you and take you somewhere else and then they bring you back and put you in bed and, when you wake up, you think that it's a bad dream"
Last September, a San Francisco man, Vadim Mieseges, made a successful insanity bid�after claiming�he had been "sucked into 'The Matrix'" when he chopped up his landlady. And�Joshua Cooke, an Oakton, Virginia, man charged with murdering his parents this February, "harbored a bona fide belief that he was living in the virtual reality of 'The Matrix,' claimed�his defense attorney.�Cooke is scheduled to stand trial at the end of June. Even Lee Boyd Malvo, accused in the series of deadly sniper shootings in the Washington, D.C.-area last fall, reportedly�wrote the words,�"Free yourself of the Matrix," in seized jailhouse sketches. "It's very hard to prove an insanity defense, even when you got all kinds of shrinks coming forward," said Robert Bloom, a�law professor at Boston College.� "Given how hard it is to prove it, the ['Matrix' defense] would seem to me to be a loser." The mother of all Hollywood insanity pleas, says David Siegel, a professor at the New England School of Law, was John Hinckley's successful�"Taxi Driver" defense for his�failed 1981 assassination attempt on then-president Ronald Reagan. "That was seen as, if not revolutionary, then certainly extraordinarily creative," says Siegel.� "It made sense, his stalking Jodie Foster, even though there was very little tangible evidence connecting the two of them." Hinckley claimed that, like Robert DeNiro, the Mohawk-coiffed antihero at the center of Martin Scorsese's film, he was so taken by Foster (who played an underage prostitute) that his concept of reality and fantasy blurred.� To get the attention of the actress, then a student at Yale University, Hinckley wanted to kill the president. "It was easy for him to use the vehicle of the movie and all the associated connections the movie had in people's minds to, in a shorthand way, explain his defense," said Siegel.� "He was able to, by putting himself in his fantasy world, explain relatively effectively his delusion.�That resonated with a lot of people. They immediately understood what he was talking about, and obviously the jury believed him." Outcry over Hinckley's case ushered in sweeping changes to the basis of the�insanity defense --��from whether�a defendant could distinguish between reality and fantasy to whether�a defendant could distinguish between right and wrong. "Now, Hinckley wouldn't be determined insane with the changes in the law," said Jacqueline Helfgott,�an associate professor at Seattle University who specializes in "the criminogenic effects of pop culture." Travis Bickle and "Taxi Driver" have long since been relegated to the classics section of the video rental store.�Today, it's Neo, the "chosen one" at the center of "The Matrix," that has inspired devotion, sometimes too much,�in his fans. That's what happened to 19-year-old Joshua Cooke,�according to his attorneys.� Cooke, whose bedroom housed a�giant�"Matrix" poster of the star and who favored the character's long, black trench coats,�claimed he�thought he was�in the Matrix when be brutally murdered his two parents with a shotgun this February. Cooke's trial isn't scheduled until late June, but�copycat crimes have already turned a corner, says Helfgott. Some movies, such as the�Woody Harrelson and Juliette Lewis road-trip bloodbath,�"Natural Born Killers,"�are particularly�fertile ground for�copycat crimes, said the professor, who teaches a class entitled "Murder, Movies and Copycat Crimes. "� "Natural Born Killers" alone� was referenced in almost 10 copycat crimes, she says. According to the New England School of Law's Siegel, "The Matrix" -- which features�a "real world" of sentient computers and their subverted human slaves, and a "virtual world" that is spoon-fed via futuristic brain modems to the cocooned humans -- takes that a step further. "I think any artistic device that includes different views of reality provides a way to illustrate someone whose views of reality may be affected by a mental disorder," he said. "It's taking people a little further into the future.� For people who are already confused between fantasy and reality, it gives them a framework to articulate it," she said.� "People who are already on the edge, it can be argued, can be set off by these types of movies." But Siegel and other experts on the insanity defense insist that, "Matrix"-influenced or not, insanity claims are simply losers in the courtroom.� Fewer than one percent of cases that are argued in court (many are not contested by prosecutors) succeed. "Insanity is so very rarely successful," says Byron Warnken, a professor at the University of Baltimore law school.� "But it fascinates us all, it's the kind of thing that is disproportionately reported.� The correlation between the real world and the movies tends to be misrepresented.� It doesn't surprise me that more and more of these are coming up."